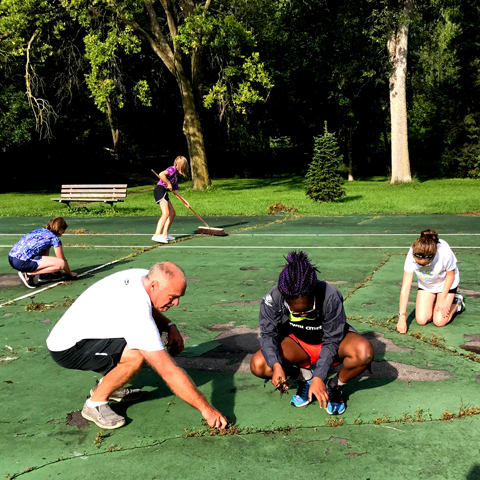 Support the Courts Foundation is an all-volunteer non-profit organization engaged in a citywide effort to reconstruct and upgrade public tennis facilities in Minneapolis. Working with city leaders, park officials, neighborhood organizations, corporations, the United States Tennis Association and hundreds of individual donors, we have reconstructed 25 tennis courts so far. Tennis is an essential activity for kids in Minneapolis. The tennis courts are safe places to play. Tennis keeps kids out of trouble, and helps them develop positive values and attitudes and healthy lifestyles. Kids playing tennis is an important antidote to crime and socio-economic disparity in the city. FRIENDS OF LORING TENNIS are tennis players who want to see the Loring Park tennis courts refurbished and maintained. Soccer and hockey and other team sports by their nature are organized groups that typically have unified voices at the Park Board and the Legislature. Because tennis is an individual sport players tend not to be well organized, and thus seldom do we speak in one voice. Minneapolis has a world-class park system and tennis courts are a prime recreational part of these parks. When tennis courts are in poor condition they become unusable for tennis and we STOP PLAYING on them. The consequence of this low usage often can result in park officials and other community leaders surmising that the demand for courts is weak. In the past this has resulted in courts being eliminated altogether rather than refurbished. Today the Loring courts fit this description of "unplayable". Thus we need to raise our voices to the Park Board and let them know that the courts are important to us and the community at large. We invite you to become part of that collective voice. Registering is free and there are no obligations other than to speak up and help us set priorities for quality public tennis courts. We are looking at a number of options which we hope will engage the community in supporting the courts renovation. One of those it the possibility of redesigning the 4 courts to accommodate pickle ball as well as tennis. The outcome would be 2 tennis courts and 6 pickle ball courts.